The Minehead Harriers, under that name, date from 1890, but long before this there were packs of Harriers hunting in the country around Minehead. 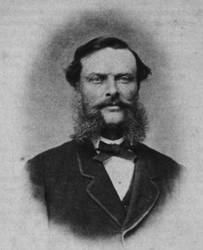 At one time during the 19th Century there were as many as eight packs of varying sizes and all privately owned. Early in 1890 a public meeting was held at the Beach Hotel in Minehead where a committee was appointed. Now at least a start had been made and a pack of Harriers called 'The Minehead Harriers' was, once again, hunting the district. 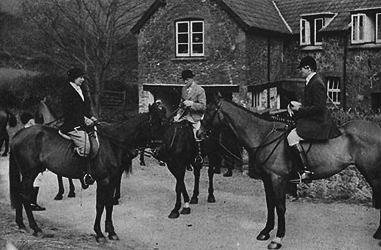 The hounds at this time, were still the property of the Master and the Hunt had no kennels of it's own. 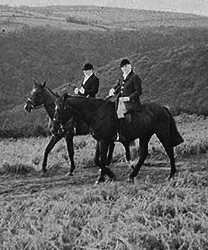 A parcel of land was purchased near Whitecross (later the Rugby ground) by Mr John Stoate with the intention of building kennels and generously allowing them rent free to the Minehead Harriers. On March 29th, 1890, at a grand ceremony attended by between four and five hundred people and the Master with 11 couple of hounds, the Baroness Le Clement de Taintegnies of Ashley Combe laid the foundation stone of these new kennels. Following the death of Mr John Stoate in 1902 the Minehead Harriers committee purchased the remainder of the lease for the Kennels. In 1933 complaints regarding the Kennels resulted in the Urban District Council requesting a meeting with Committee representatives. 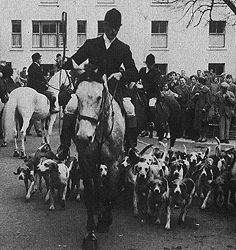 The meeting took place on 23rd November in a very amicable atmosphere and the Council expressed their appreciation of the Hunt and its benefit to the town. The town was, however, extending around the Kennels and the time seemed opportune for moving to a site further out. It was to be many years however before the Harriers moved from Mr Stoate's Kennels. 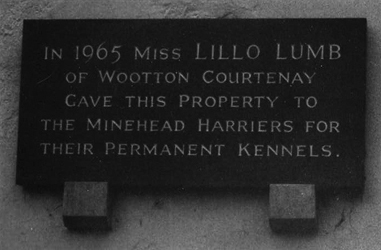 In 1956 an offer by Mr and Mrs Claude Gooding to lease Huntsman Cottage with its outbuildings, on the outskirts of Wootton Courtenay, to the Harriers for their new Kennels was quickly taken up. The site was ideal but there was, of course, the snag that the property would only be leasehold, but it was felt that this solved a problem that had bedevilled the Harriers for so many years. In May of 1963, Mr Gooding of Ranscombe intimated to the Master that he might be prepared to sell the Kennel's property to the Hunt - a figure of £3,000 being mentioned. This was, at first, not seriously considered but, in January 1964, the Chairman asked the Master to remind Mr Gooding of his offer of the property at the price he had mentioned. Mr Gooding's reply was that he was still willing to sell but before going any further would have to have the property valued. 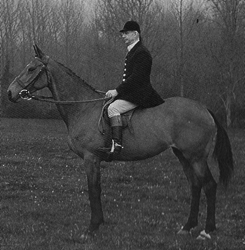 The valuation turned out to be £5,000, a figure the Hunt Committee felt to be far above their means. While other options were being looked into, unknown to everyone but the Honorary Treasurer - Mr Tazewell - who was sworn to secrecy - Miss Lillo Lumb had decided to purchase the whole Kennels property and present it to the Hunt. To this effect she made arrangements with her own solicitor so that the Kennels should belong to the Harriers in perpetuity, with no strings attached, neither during her lifetime or after her death - save only one, that the gift was to remain anonymous. Miss Lillo Lumb & Captain James Best R.N. After Miss Lumb's outstandingly generous gift the Finance Committee unanimously agreed that she should be made a Life Member of the Hunt and forbidden to pay any future subscriptions. Only once, until after Miss Lumb's death when of course all the facts had been made known, was an awkward question asked in Committee regarding her membership and this was successfully side-stepped. 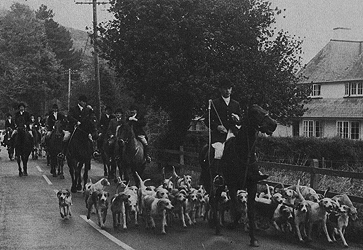 With the ownership of their own Kennels, a flourishing Hunt Club, a fine pack of hounds and ever increasing numbers out hunting, the Minehead Harriers look set fair for many years to come.